Baseball caps and bucket hats are popular projects for a first-time experience with marbleizing. 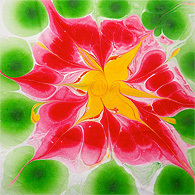 Paula has developed a variety of floral patterns for fabric dyeing: Hibiscus (above), Morning Glory, Peony, Poinsettia, and Spring Iris. This fabric pattern is called "Indian spices." Harmony Arts Café Offers a Menu of "Art Projects to Nourish the Soul"
One afternoon in November, after parking my car in the Harmony Lot near the back entry to ArtRageUs1 (a local arts collective on the Walk), I noticed a sign reading "Harmony Arts Café." I followed my curiosity right away to find out what this "eatery" might offer and, since it sounded arty, to encourage the owner to join the Gallery Walk. Paula Lavender guides a student preparing to create a colorful marbleized fabric. As I opened the door and walked in, I was bombarded with splashes of color from all directions. Scanning the room's comfortable seating spaces and work tables, as well as arrays of marbleized hats and colorful squares of dyed cloth, I was drawn to a 6-ft.-or-more-high by 3- or 4-ft.-wide display of ribbons to tempt my crafty heart. A couple of young teens were sitting on a couch and floor nearby, chatting animatedly while handcrafting some original holiday cards as I took in the scene. The owner, Paula Lavender, stepped out from behind a screen of equipment and materials to greet me. It turned out that we had met a few weeks earlier during a Compass School family event—her son and my granddaughter enrolled there are about the same age. Only now in our getting better acquainted did I realize that Paula and I actually had first met a couple of decades earlier, when she had a shop on Main Street called "Dyeing to Impress You." One of my daughters, twenty-something at the time, had worked with her in that early studio. I still treasure a set of blue marbleized napkins gifted to me at the timemdash;they are used for all our family holiday meals and dinners with company. 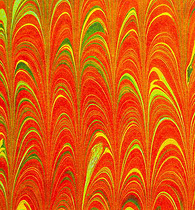 "I studied techniques of marbling and dyeing more than twenty-five years ago," explained Paula. After experimenting with that former retail space downtown for a year or so, she retreated to her studio to make fabric for quilting and home decorating. "I also taught art in the community to people of all ages and abilities, and I am currently combining all of these skills in the new Harmony Arts Café studio and teaching space," she said with pride. "It's a space that works for dropping in and creating crafts or art projects with weekly themes. The Make-and-Take projects include paper arts, jewelry making, and crafts using items from nature." 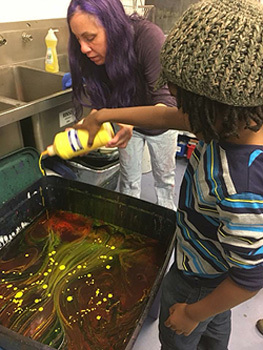 The dye studio at the café offers demonstrations for the inexperienced and an opportunity to make fabric that is tie-dyed, marbled, painted, printed, or stamped. Participants enjoy marbling hats and dyeing clothing with Paula's guidance. Other projects usually available include making duct-tape wallets, creating handmade paper, and experimenting with 2D or 3D felting. Paula also teaches students how to sew their uniquely designed pieces of fabric into a variety of useful items such as tote bags, pillows, and quilts, whether for personal use or special gifts. Instruction in using the studio's quilting machine to add dimension to fabric design details is available for advanced students. Subscribing to the operative slogan that the Harmony Arts Café is "Serving Art Projects to Nourish the Spirit," Paula's goal is to offer fun for the whole family, whatever the ages and abilities involved. This is especially attended to through the Art Party menu option, where each gathering is designed especially for the group and occasion. Paula's years of broad teaching experience are a great help in her party-planning success. A copy of the Café's general menu is on its Facebook page at https://www.facebook.com/HarmonyArtsCafe, but stopping by 22 Harmony Place is the best way to appreciate the range of projects and supplies available. Hours are Mon.-Sat. 10-6 (later on Gallery Walk first Fridays), and Sun. 10-2óthis Sunday time is particularly good for family projects. The phone is (802) 490-2077.